FED quantitative easing exit: has it started? The FED 0.25% discount rate hike yesterday evening came as a surprise. Banks are now borrowing at 0.75% instead of 0.5%, not a big deal: there is still plenty of space for banks to play the yield curve. Two days ago I wrote that I did not see a hike in interest rates any time soon, so this move is a surprise regarding the timing. First, its significance is rather minor since it is applied to emergency funds provided by the FED to financial institutions. The fed funds (0.25%) are the ones that really matter since they impact borrowing costs for companies and consumers (mortgage in particular) and the FED indicated that an increase in the discount rate did not imply an increase in FED fund in the future. Second, I view this increase as is a signal sent to the market psyche about the FED seriousness in preparing the QE exit, controlling future inflation and therefore tame investors' future inflation expectation to keep rate in check (don't forget that the US a has a huge debt to finance). True, the Fed had been warning for some time that this was going to be part of the process of taking the emergency stimulus out of the financial system and Wednesday’s FOMC meeting contained recommendations to start raising the discount rate as soon as possible. However, the difference between fed funds and the discount rate is only increasing to 0.5% from an average of 1% before the crisis. This move is really a "marketing" exercise than a real shift in policy. It is also a way to make banks a bit less comfortable (this plays in Obama's hands). If TIPS are a good indicator of forthcoming inflation (which is really debatable), there is nothing to worry short/medium term. In any case the economic recovery is pointing towards a slow and bumpy one and wages are still in a deflationary environment with food and energy prices contained: without wage inflation and /or energy/commodities inflation, there will be no inflation near term (longer term we will get it due to all the money created worldwide). CPI number for January came at 0.2% today and -0.1% for core CPI (i.e. less food, energy and commodities), and 2.4 over the past 12 months (unadjusted) mainly due to energy prices hike. So, it would stand to reason that the real test for the markets is going to come not from the discount rate, but by what happens when the Fed begins to shrink its balance sheet — particularly the ramifications for mortgage rates. Last word: policy makers are prone to mistakes; I hope that my analysis of the stance taken by the FED is right, otherwise run for cover! This graph is posted without further comment. After a 10% decline between 20th January and 5th February, the S&P 500 is recovering and is still above its 200 days moving average, itself in a positive slope. We are now 10 month up after the trough reached on 9th March 2009. The magnificent 7 are telling us that there is no reason to become negative on equity (I recommend the reader to go to the GTI web site for their monthly newsletter, one of the best available – don’t forget to tell them that you are coming from Markets & Beyond). S&P 500 Banks index: For 6-7 months the index has traded in a narrow 120-140 band. 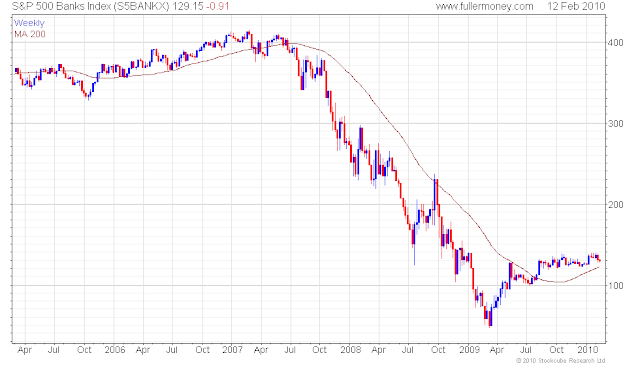 The index and the 200 days moving average continue to. 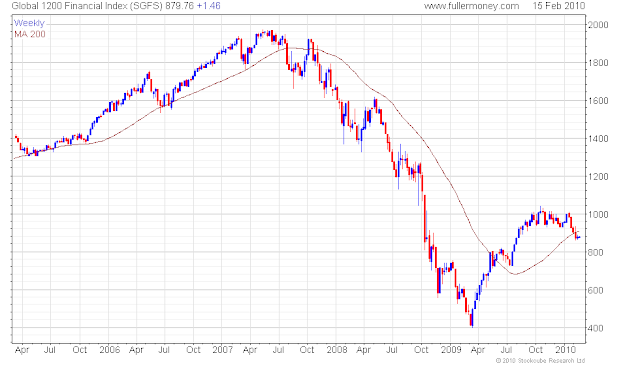 The index is still 70% below the nadir reached in February 2007. The 120 support is holding very well. Positive. Global 1200 financial index: The world financial sector did not hold the 1000 mark reflecting woes with sovereign risk in Europe, Greece in particular, and European banks exposure to this risk. 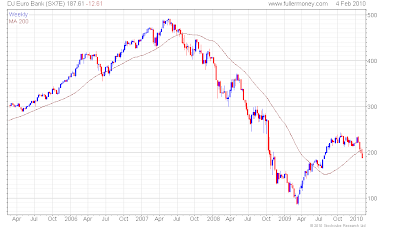 The index went through the 200 days moving average but is not extended its losses. Positive. TED spread (LIBOR USD 3 mth - US 3 mth T-bills): The spread is holding well its normal levels and is below 20 basis points (0.20%). The interbank market shows no stress. Positive. 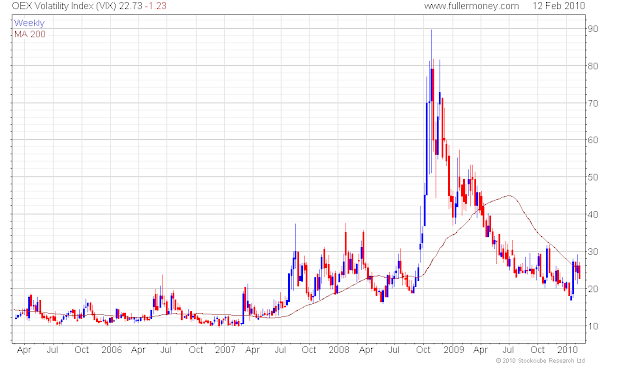 OEX volatility: OEX volatility had a spike corresponding to the Greek problem, but quickly came back near to previous levels. We need this indicator to stay at or below 20% however. Neutral. S&P Case Shiller house price index: The latest data (November) published 26th January marked approximately 10 months of improved readings in the annual statistics, beginning in early 2009, and is the third consecutive month these statistics have registered single digit declines, after 20 consecutive months of double digit declines. Adjusted numbers show the 6th m/m consecutive increase in both indices; the unadjusted data are however showing for the 2nd consecutive month a slight decrease. Prices for both indices are back to late 2003 level. The signals are still unclear concerning the health of the recovery despite prices falling less rapidly y/y. Oil price: The oil prices continue to be capped at +/- $80/b. Not much happening on the energy front. In the US gas prices have recovered to +/- $6/btu from +/- $2.5/btu. One interesting development is the announcement of a new nuclear plant being commissioned in the US for the first time in 30 years: Positive. Conclusion: All these indicators but OEX volatility (neutral) are positive. I was expecting a 20-25% correction and only 10% did materialized. I am again ambivalent: in the US, news are getting better if not great on the economic front and the earning season was good with 70% of companies reporting better than expected numbers, but are deteriorating in Europe. They look OK in emerging markets, China slowing down what was becoming an overheating economy, particularly in the real estate sector, and India expecting to grow above 7%. Nevertheless, there are strong headwinds ahead: wages are in a deflationary mood in the Western world, unemployment remains high, budget deficits are not really improving with a GDP growth which is muted, public debt is growing faster than ever. I do not expect any tightening by the FED and the ECB any time soon despite the rhetoric: we still are in a deflationary environment, and bank’s balance sheets are not strong enough to weather any large additional shock. Concerning Greek’s crisis, Thursday’s declaration of European Union leaders at a summit in Brussels stated that Countries belonging to the euro "will take determined and coordinated action, if needed, to safeguard financial stability in the euro area as a whole”. Once more, words, hot air, waffle but nothing concrete. Sarkozy says that Europe will not let one of his members default? Where is the checkbook? Markets need facts, not words. 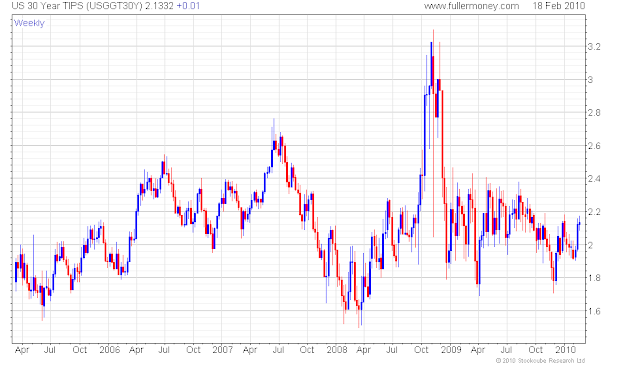 This just shows how flawed the European Union construction and the Euro are under the past and current rules. After joining the Euro with over-valued currencies, Club Med countries (you can add France and probably Belgium to it) carried on profligate policies and did no make any serious progress towards in-depth reforms to reduce/eliminate budget deficits and lower the debt/GDP ratio. Policies have been short sighted, but reality bites. And the Treaty of Lisbon is another fraud: what was meant to designate a strong President of Europe and a unified foreign policy in total transparency ended up with a puppet President and an incompetent Foreign Minister both nominated behind close doors after petty bargaining. Politics guided the EU construction and not sound and down to earth precepts. The one fits all does not works. The real problem is the huge differences in competitiveness between the eurozone's richest and poorest members. Having more members for the sake of showing to the public (voters?) momentum in the EU construction and believing that countries would do whatever is necessary to fit in is non-sense. The Greek central bank trafficked data to abide by the Maastricht criteria and join the Euro; this was known and no sanction has been taken for the past 11 years. In 2004, along with Germany, France succeeded in forcing the EU to relax its strict eurozone rules (maximum 3% budget deficit/GDP and 60% debt/GDP), allowing both member states to continue overspending. For example, since 2002 France had 5 years (including 2009) above the limit for budget deficits and since 2003, every single year its debt/GDP has been above the limit. The global financial crisis is either pushing reluctant European governments (and understandably) toward deeper economic and political integration with a loss of sovereignty or leading to a different form of European governance, where countries not abiding by the Maastricht treaty convergence criteria would get real sanctions or get out. My choice is for the latter. 2. What’s on for Greece? There is no good choice for Greece: after decades of free ride, Greeks will have to pay the bill that stands at EUR 254 billion. However you turn it, Greece is in for several years (a decade?) of recession, or even depression. I read in several papers that Greeks are moving their money away from Greek banks and send it abroad. Time is really running short and politicians will not be able to blame anybody else but themselves for this sad story (but the usual speculators – easy and populist). European countries are in no fiscal position to bail out Greece (and then Portugal, Spain, etc. ), and should not in any case. In addition, EU treaty clauses restrict bailouts of euro member countries. Why the German taxpayer should pay for the lack of efforts of Greeks? "The numbers as of last June were France €86 billion, Switzerland €60bn, and Germany €44 billion. I have seen more recent numbers of France €73b, Switzerland €59b, and Germany €39b. In terms of GDP, for Germany it is minimal - just over 1%. Of more concern, for France it is nearly 3%, and for Belgium 2.5%. For Germany, the debts of Ireland, Portugal and Spain are much bigger problems. They may, however, worry that if there is a contagion, they will have to take marks on that debt. That would be a real problem - nearly 15x the size of the Greek issue." Despite probable hedging and taking into account that a defaulting Greece would not result in the debt being worth nothing, it could however trigger a new credit crisis since all countries with high debt and high deficit with no severe measures taken to reduce them would see CDS spreads widen and Government bond yields turn much higher. Many countries would see their ratings cut (but for pressure on rating agencies). However either the ECB would jumped in and provide ample liquidity and/or the mark-to-market will be replaced by a “managed” mark-to-market. Let’s the IMF do the job in Greece; after all, Hungary and Latvia had the IFM coming to the rescue, why not Greece? I do not see how Greece can reduce its deficit below 3% of GDP by 2012 with the longstanding distrust of Greeks in their successive Governments and public sector employees already striking before reforms start to bite (by the way who knows whether their real deficit is 13% and not 15% like Stratfor estimates or more - Greece apparently hid about 40 billion euros of debt from the public and EU governing bodies? Why should we believe their official numbers now when they have cheated for 11 years?). Greece has been in default for 105 years out of the last 200. They have never had a balanced budget, at least not willingly. And why should Greece get a special treatment when Ireland is making very strong and difficult efforts to put its house in order without asking anything to anybody? Greece could not borrow in the international debt markets even at prohibitive rates; they would be forced to control their budget by the IMF (or the EU?) and would probably get into a depression. This is the price to pay and it would serve as a warning example to all other countries that have lax fiscal policies in Europe. This would be very positive long term for the EU. Otherwise, Germany and some others countries controlling their budgets and taking the tough route of deep reforms will get fed up and could try a new experiment: a two tier Europe centered on Germany where new countries would be allowed to join after having demonstrated for a number of years a responsible behavior. The interesting point would be France that sits in the middle. Whatever the solution found for Greece, it cannot be in isolation: Portugal, Spain and Italy have also to be taken into account, and possibly France and Belgium. Whilst it would no be the end of the world, it would be a remake of the financial turmoil of 2008/2009 with different actors: the sub prime and banks would be replaced by Sovereign states. The collapse of the EUR 250 billion (300? 350?) of Greek debt would rapidly reach Portugal, Spain and others with EUR 2 trillion of debt downgraded. 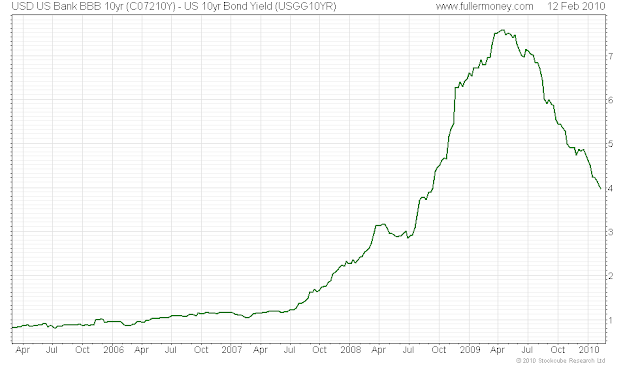 We would either risk a severe depression or more quantitative easing leading to inflation later on. Anyway ugly, and better to swiftly deal with the Greek problem and rapidly find solutions for Portugal and Spain. At this juncture of the current crisis, we have move to the real possibility of debt defaults of a sovereign nation in the Western world (Japan included and in the first line of fire). Like any corporation or any household, a country cannot live for ever on recurring budget deficits and increasing debt. Last thing, this is happening when Europe went to a standstill GDP growth in Q4 and China is tightening bank’s lending belt. Axel Weber, President of Germany's Bundesbank, warned this week there is a chance his nation's economy will contract in the first quarter of 2010, in a major blow to recovery hopes. One brighter spot, the economy seems to be getting traction in the US as showed by the data released for January; however with the economy still shedding jobs (albeit at a lower rate), the housing market still wobbly and household debt shrinking, consumer spending is likely to remain subdued. Bond vigilantes are out and are not going to wait forever: the few coming week are going to be the day of reckoning for many countries with unsustainable deficits and mounting debt. Greece needs EUR 20 billion in April to refinance maturing debt. The day of reckoning is going to be particularly painful for policy makers who have used scapegoats to avoid taking unpopular but necessary reforms: they are in the frontline now and cannot hide. Unfortunately, the population will also suffer and dearly. Remain short financials and the EUR. Be long precious metals and companies with low/nil debt, strong franchise and able to pay a 3%+ dividend yield (pharma, energy, water, staples), and technology (selectively). Telegraph: Will markets call EU bluff on Greek rescue? Yesterday, I posted a comment on US unemployment data (I am most interested in today’s release to see were the U6 is heading to) and since I found an interesting chart on short selling for sovereign debt via Business Insider. It tells that Greece is by far not the only country where sovereign risk is rapidly increasing. 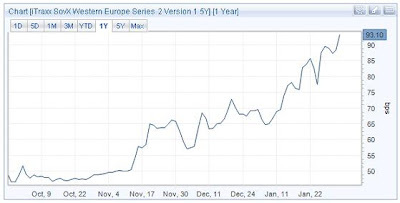 Since November the SovX Western Europe index doubled to over 90 bp (via Alphaville). This morning, as I am writing (GMT+1), the Euro continues to under pressure at 1.3670 vs 1.3897 yesterday morning and 134026 the high of the week reached Wednesday. Europe will need more than word to calm investors, at last. More U.S. workers unexpectedly filed for jobless benefits last week. Initial claims for state unemployment benefits increased 8,000 (28,000 unadjusted) to a seasonally adjusted 480,000 in the week ended Jan. 30, the Labor Department said on Thursday. That was above market consensus of 460,000. As for productivity, it kept surging during the fourth quarter at 6.2% annual rate and 7.2% in the third quarter (the biggest one-year gain since 2003) with labor cost dropping 4.4% (0.9% for all 2009). This is not surprising since companies continue to lay off workers and wage are still in a deflationary environment (high and rising unemployment and continued delocalizations). Whilst this bodes well for corporate earnings, it is not encouraging for consumption; this recovery will not be sustained without a brisk improvement in the labor market or a new stimulus package which, I hope, will never come since it would be disastrous beyond the short term effect, adding debt and leading to the eventual collapse of the economies concerned. It is not possible to postpone needed adjustments by buying growth via successive stimulus packages without seeding even more difficult circumstances. This is combining with widening spreads in the debt markets. We have not finished with PIIGS countries in Europe (Portugal, Italy, Ireland, Greece and Spain). Greece is in a very bad shape and the main labor union today called for a strike: this does not bode well for the success of needed reforms to be implemented there. My next main worry is Spain, the fourth largest economy in the Euro-zone. The EU's endorsement of Greece's budget plan is not going to calm investors’ fears, if one refers to the poor track record of the EU with its own rules (look at France for example or past Greece trafficking of central Bank numbers to join the Euro): politics will always come ahead of reality, even if short term expedients are long term detrimental to what federalist European politicians want. By the way, the Greek Prime Minister points the finger at speculators, the usual scapegoats… (note that when they are going along they are investors, otherwise speculators), and not reassuring. It would be quite an irony if a new crisis was to originate in Europe without Governments being able to blame the US for their own sins: a much too rapid integration pushed forward by federalist politicians. What is happening in Greece (and wait for Portugal and Spain) is just exemplifying that without deep reforms undertaken, lax fiscal policies, large public sector and unbearable social benefits coupled with an aging population lead to run away budget deficits and commensurate debts. Also, by not acting when they could (some still can, but time is running short rapidly), it is a certainty that markets will call the shots. 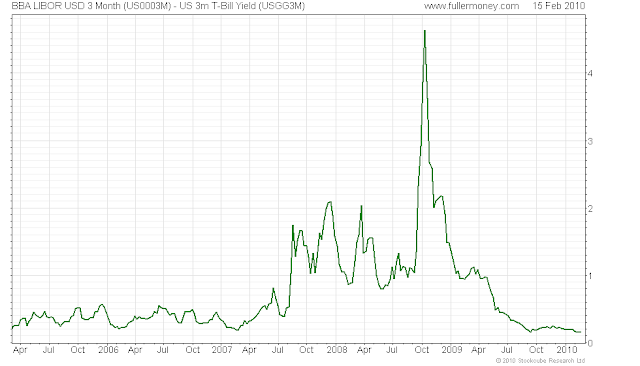 The risk is that the deterioration of sovereign debt spreads to the corporate sector which seems starting to happen. Markets, already fragile, have reacted negatively to the numbers and the deteriorating Euro-zone sentiment, deepened losses as I am writing (-2.3% for the S&P 500 and the DAX); banks are being hit very hard (-5.5% DJ STOXX 600 banks). Precious metals are also taking a hit (gold -4%, platinum -3.9% and silver -5.3%) like Q3 2008. It looks like a repeat of Q3 2008 when all asset classes collapsed (but Treasuries playing their safe - not so safe - haven status). I do not know whether we will have a repeat of last year meltdown (I rate it a 10% possibility even to a lesser extent), but it will largely depend on Europe's seriousness and speed of response to the Club Med imbalances crisis (by comparison, this helps the US hence the dollar rally). Markets are also saying that Western countries cannot carry on printing money, contemplate budget deficits running away and ballooning public indebtedness: it is a warning shot. 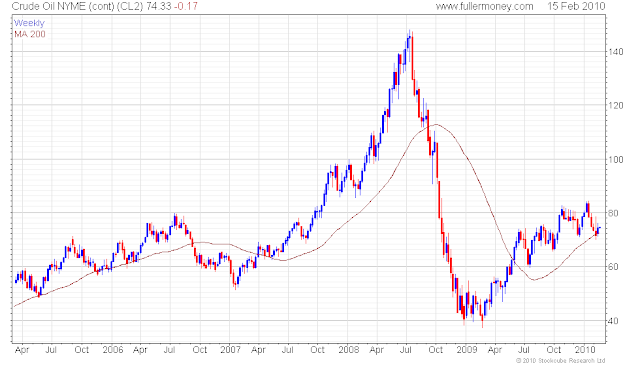 The Chinese market was a leading indicator in 2008 as were banks, both down and up. Watch bank indices and the Shanghai index together with the S&P 500 and the NASDAQ: 200 days moving average have been reached and in the case of the DJ Euro Banks breached with conviction. One of my recommendations of the year was to stay away (or be short) of financials in 2010: no change! I will be away travelling to India for a couple of days, which should be most interesting, and therefore will not post any comment during this period.